I'm a believer in the theory of cumulative fatigue. So a couple years ago, when a friend asked for some marathon advice, I suggested de-emphasizing the long run, and instead placing a focus on consistent mileage and quality workouts. I told her that I believed that running marathon paced workouts on tired legs would serve her better than having one disproportionate workout per week that required sacrificing the next several days to recovery. Now, she really had no reason to believe me, since at that point, I had run one marathon and it had not gone that well, and all the plans by established coaches like Pete Pfitzinger and Jack Daniels had 20 mile runs in them (I did run a better one later, and trained for that race using the principle of cumulative fatigue). However, I had some ammo: a Running Times article about a method used by two brothers in Michigan who have had success using the principle of cumulative fatigue to train elite distance runners. The result? She PRed and qualified for Boston. Last year, Luke Humphrey, a Hansons athlete, exercise physiologist, and coach at Hansons Coaching Services, wrote Hansons Marathon Method, which detailed the training philosophy used by the Hansons Brooks Original Distance Project. A lot of people are under the misconception that Hansons Marathon Method is about a 16 mile long run. This couldn't be further from the truth. The Hansons plan is about having a proportionate long run worked into a week full of quality workouts and recovery runs, such that the long run, as well as the other workouts, are run on tired legs, such that they simulate the end of the marathon rather than the beginning. In addition to the long run, the training plan also involves easy days and "something of substance" workouts, which include speed workouts, strength workouts, marathon-paced tempo runs, and the aforementioned long run. All of these workouts, as well as the physiology behind them, are explored in the book. For those of you who have read Daniels' Running Formula or either of the Pfitzinger books, you know what to expect as far as scientific explanations go. Hansons Marathon Method is not a textbook like Lore of Running or Better Training for Distance Runners. While Humphrey is an exercise physiologist, he clearly writes for the layman and keeps his book easy to read and simple to understand. On the other hand, he does delve into the physiology more than Hudson's Run Faster, for those of you familiar with that book. (Reviews of most of those books can be read here, if you're curious). Hansons Marathon Method includes both a beginner plan and an advanced plan, and I would warn those of you who are not used to running 6-7 days per week to consider the beginner plan, even if you have run one or more marathon in the past. The effects of cumulative fatigue are not to be underestimated. On the other hand, for those of you who are used to running big mileage weeks, Humphrey includes information on how to increase the plan's mileage. Finally, Humphrey includes his own training plan, in case you're wondering how actual Hansons runners train. There are also brief sections on supplemental training, nutrition, running gear, race tactics, and recovery. The nutrition section especially has some pretty interesting stuff on how much to eat during the race itself. Something thing to keep in mind is that Hansons Marathon Method is very much a book for marathon training, and perhaps half-marathon training. The principles contained in the book would not easily translate to say, 5K training. The other thing to keep in mind is that the schedules contained in the book are still generalized pre-written book schedules that don't account for...well, you. If that's all there was to coaching, Humphrey probably wouldn't bother to offer personalized coaching...he'd just sell you his book. Humphrey includes enough information such that you can modify them appropriately to work for you personally. Do so. But be honest with yourself (the hardest part of coaching yourself). Hansons Marathon Method provides a solid foundation for training yourself to a good marathon. There's no magic involved, and I have a feeling that the "secret" is simply that it gets many people running more, and the ability to run on tired legs is key to running a successful marathon. It also is a different training stimulus for those of you who have run several marathons using the Daniels or Pfitzinger method, and the new stimulus can potentially help you reach a new level of fitness. On the other hand, it's not a textbook for those of you who absolutely love physiology, and it doesn't bring anything super groundbreaking to the table if your bookshelf is already jam-packed with running books (although if you bookshelf is jam-packed with running books, you probably already own this book). I'd recommend this book for marathon newbies and veterans alike who are looking to self-coach their way to a good marathon, who are open-minded enough to understand that 20 miles is an arbitrary distance and shouldn't be dogma, or who are curious about the way it's done in Rochester Hills, MI. 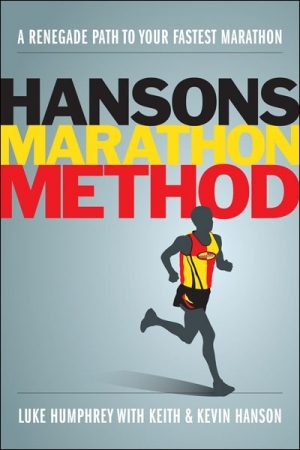 Hansons Marathon Method by Luke Humphrey retails for $18.95 and is available on Amazon. Full disclosure: Not much to disclose, as this book was a personal purchase. The opinions expressed in this review are mine and based on my experience, and do not reflect the opinions of Luke Humphrey, Keith and Kevin Hanson, Velopress, or anyone else. It's kind of sad that consistent mileage accumulated by daily running is a "renegade path" now, though I feel like that's not far off. I think people are sometimes too focused on feeling like they won their workout, and lose sight of the big picture. The goal is not to puke, pass out, or lay on the floor beside the treadmill for ten minutes; the goal is to apply consistent and sustainable stress, and build fitness gradually. Race on race day. But, uh, good review, as always. Rant over. Heh, I certainly agree with your point. The principles in the book are sound, but they are what many of us understand (although I admit I've sometimes inserted disproportionate death workouts, though not without following it up with 10 miles easy the following day). Renegade is simply good marketing...everyone wants to be a rebel, and it's less unwieldy than "The path that understands that 1 killer workout per week with the next two days off isn't sound training!" As I said in the review...nothing groundbreaking, but good, sound information, nonetheless. Yet another refreshingly thoughtful and candid review! Balanced training, not pushing people to overload a single day of weekly training, does indeed run counter to the status quo. Heck, it seems that running with a genuine performance focus anymore is a "renegade path" - especially among the marathon ranks that are swollen with completers of charity, bucket-list-one-and-done, and one-per-state stripes. I have no problem with charity runners, bucket list runners, and 50 staters (and actually know a few 50 staters who are pretty quick), but I do agree that it seems like there are less and less people who run with a genuine focus on performance (or at least those who are willing to put in the Trial of Miles rather than hope for a quick fix to get faster). Honestly, I think any motivation people have to run is fantastic, and I respect that people have different priorities and motivations, and that a primary focus on performance isn't for everyone, but I think it's a mistake to attempt a marathon if you don't have the time or motivation to train for it properly. 5Ks and 10Ks are every bit as challenging as the marathon when raced hard enough, yet they're more accessible to someone who can't put in marathon training. Speaking of 10Ks, you running BolderBoulder this year? If so, good luck! Thanks for the link! I didn't even know Bill Squires had a book out. And a 409 page one too...is it more science-y or more accessible to the masses? Did not intend to imply any value judgment in my observation - though I may favor the "renegade path" over others, I do not disparage others' constructive paths. I do feel the sport would be healthier if people were pushed/drawn more to 5K/10K races (though there were two cardiac arrests and one stroke along the BB course on Monday) than to the marathon in a significantly undertrained state. Anyway, yeah I once again loped through town on Memorial Day and thanks for the well wishes, it went about as expected given my training investment. I had a good time racing hard on that course. I will likely post up a more in-depth reflection on my own blog (and link via twitter) a little later. I found Squires to be sufficiently accessible - certainly moreso than, say, Coe and Martin's Better Training For Distance Runners. The majority of those 409 pages are training plans, it is a schedule-and-log-in-one. I like it a lot and endorse it for anyone who wants to go the training guide route, over any others I have read. I was thinking about getting the one reviewed here back in January, yet when I skimmed through it in the book store I did not feel that I would gain much in reading it beyond what had already been covered in Running Times.